We all possess inner strength, fortitude, and confidence. However, all too often owning and using these traits are two very different things. Dr. Deb. Carlin is known for guiding clients, organizations, and individuals, to achieve the critical integration of their personal and professional life. This brand of self-improvement strategy requires finding your inner strength. In Build The Strength Within, you are taken through a series of eleven self-assessments, each designed to bring light to your strengths and weaknesses. After you have completed your personal evaluation, you are introduced to options for specific plans of action to utilize as you build your unique Blueprint for a Successfully Intentional and Integrated Life™. Build The Strength Within is organized into five sections based on the video series, The Series 16: The Strength Within© where Dr. Deb. blends personal experience, theory, and data while underscoring the importance of a clear and intentional life plan. This step-by-step self-improvement process enables you to build your dream life with actionable goals to help you achieve it. Eleven self-assessments and eleven plans of action all culminate in an exercise to build your blueprint. The intent is for you to map it, build it, and renovate your self-improvement plan when appropriate. Stop wasting time, your best life awaits you. 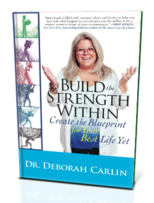 View a sneak peek of "Build the Strength Within"
Dr. Deb has designed a blueprint for a successfully intentional & integrated life. Read the book and fill out the blueprint, self assessment cards as you go.